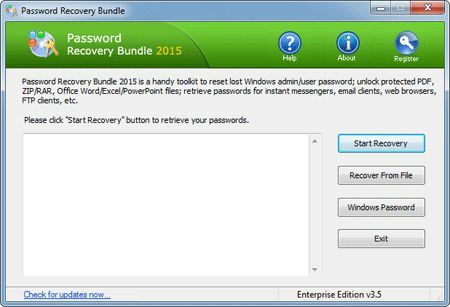 Password Recovery Bundle Powerful All-In-One Password Recovery Software is a handy toolkit to recover all your lost or forgotten passwords in an easy way! Quickly recover or reset passwords for Windows, PDF, ZIP, RAR, Office Word/Excel/PowerPoint documents. Retrieve passwords for all popular instant messengers, email clients, web browsers, FTP clients and many other applications. A useful password recovery software for both newbie and expert with no technical skills required. No need to call in an expensive PC technician. 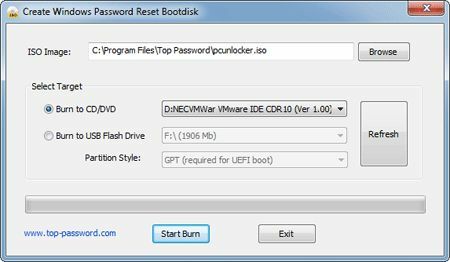 Instantly bypass, unlock or reset lost administrator and other account passwords on any Windows 8, 7, 2008, Vista, XP, 2003, 2000 system, if you forgot Windows password and couldn’t log into the computer. It can also reset Windows domain administrator/user password for Windows 2012 / 2008 / 2003 / 2000 Active Directory servers. Retrieve passwords to mail accounts created in Microsoft Outlook 98 / 2000 / XP / 2003 / 2007 / 2010 / 2013, Outlook Express, Windows Mail, Windows Live Mail, Hotmail, Gmail, Eudora, Incredimail, Becky! Internet Mail, Phoenix Mail, Ipswitch IMail Server, Reach-a-Mail, Mozilla Thunderbird, Opera Mail, The Bat!, PocoMail, Pegasus Mail, etc. PST Password Recovery – Instantly recover lost or forgotten passwords for Microsoft Outlook 2013 / 2010 / 2007 / 2003 / XP / 2000 / 97 personal folder (.pst) files. Office Password Recovery – Recover forgotten passwords for Microsoft Office Word / Excel / PowerPoint 2010 / 2007 / 2003 / XP / 2000 / 97 documents. SQL Server Password Recovery – Reset forgotten SQL Server login password for SQL Server 2000 / 2005 / 2008 / 2012 / 2014. Browser Password Recovery – Recover passwords to Web sites saved in Microsoft Internet Explorer 6 / 7 / 8 / 9 / 10, Mozilla Firefox, Opera, Apple Safari, Google Chrome, Chrome Canary, Chromium, SeaMonkey, Flock and Avant Browser. It also allows you to remove IE Content Advisor password. FTP Password Recovery – Decrypt FTP passwords stored by most popular FTP clients: CuteFTP, SmartFTP, FileZilla, FlashFXP, WS_FTP, CoreFTP, FTP Control, FTP Navigator, FTP Commander, FTP Voyager, WebDrive, 32bit FTP, SecureFX, AutoFTP, BulletProof FTP, Far Manager, etc.